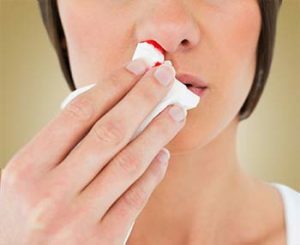 Nasal bleeding (Epistaxis) is bleeding from any area of the covering that covers the nose. Bleeding; Depending on its location, from the front nostrils or from behind the nose to the mouth. Approximately 10% is seen in our society. Blood does not usually refer to a health facility. Nasal bleeds are one of the most common diseases of ENT emergency. Although most hemorrhages have mild bleeding, there may be serious life-threatening hemorrhages. Children and adolescents have more nasal bleeds in the front, and older adults and hypertension are more likely to have posterior nasal bleeding. Most of the epistaxis are unilateral because of the cracking of a capillary vessel in the anterior part of the nose. The hemorrhages are usually caused by the dryness of the dry air and the drying out of the covering that covers the inside of the nose. Because the veins on the anterior part of the nose are thin and superficial, they can easily bleed with nasal irrigation and nasal mixing. These hemorrhages can usually be bilateral in unilateral rarity. It is easy to control the bleeding in these bleeds, which often stops spontaneously. 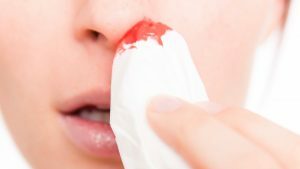 Rear nose bleeds are frequently seen in middle- and older ages, especially those with hypertension or nose-faced injuries. There is bleeding in the upper posterior part of the body and the severity is much higher than the anterior nose bleeds. In the back bleeds, blood is often nasal and in the same place. Control of these bleeds is difficult, requires hospitalization and extra precautions. What should be done to stop the bleeding for Epistaxis? First, the patient is calmed down. Panic or extreme excitement increases blood pressure and increases bleeding even in people without a tension problem. The head should be tilted forward so that the blood is swallowed to the midway. 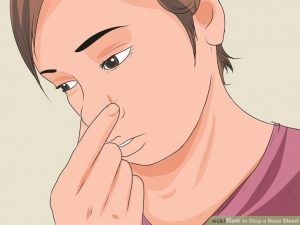 The soft part of the nose should be compressed with the thumb and index fingers for 3-5 minutes. If it is still bleeding after the suppression, the nose is removed from the nose by pulling the nose cold water. This process is continued for a few minutes. In this way, 70-90% of the bleeding is stopped. If bleeding does not stop, the nearest ENT specialist should be consulted urgently. What does the ENT physician do in treatment? Back nose bleeds, blood pressure medication and hypertension patients should be admitted to the hospital, necessary tests should be done and appropriate medicines should be given. The posterior nasal cannulas may be inserted into the back nasal pad or special inflatable silicone bumpers which reach up to the nose and apply pressure to the bleeding area. In the presence of systemic disease, consultation is required and the treatment can be regulated from the relevant departments (such as Neurology, Cardiology or Internal Medicine). However, in a patient group that constitutes a small percentage of the bleeding, the patient is taken to the operating room and the bleeding area is treated by performing necessary interventions in the operating room. What should be done to prevent recurrent izof bleeding in those who have recurrent nose bleeds? These patients should be cleaned gently and frequently with salty water spray. Nose mixing habit should be abandoned. Water should be drawn frequently and should not be gently quenched. Severe physical activities should be avoided. The predominant environment should be moistened. Do not bathe with hot water. Should not be in hot and dry environments, should bring environment heat and humidity to favorable conditions. 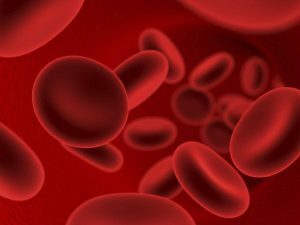 Aspirin and similar blood-thinning drugs should not be used without a doctor’s recommendation, and bleeding-clotting tests should be regularly checked in patients who use it. Patients with hypertension and similar systemic diseases should use their medicines regularly, should not interfere with their doctor’s appointments and control, and pay attention to their diets (salt, etc. ).